Once on your EdReady site’s homepage, click on the Get Started button to register for the site. If you’re already registered, skip ahead to the Log In section of this guide. On the Sign Up page, enter your name, email address, password, and zip code. (Depending on your institution's settings, you may be asked to provide additional details.) The email address you enter will be your username for EdReady. Make sure that you use a valid email address that will remain accessible to you. EdReady will send messages (such as password reset emails) to this address. If you will be using EdReady with a screenreader or require other accessibility options, click the Show Additional Options link to view additional settings. Select the best options to maximize your EdReady experience. You can learn more about these setting in this article, but it is important to note that this setting will change the on-screen display and the resources and questions you have access to, so you should NOT select it if you do not require it. 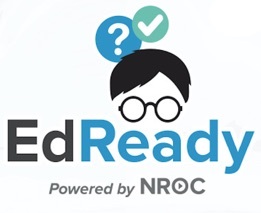 Once you are finished, click the Sign Up for EdReady button. Note: there may also be an Enter as Guest button – DO NOT USE THIS BUTTON. If you do, your account won’t be created and any progress you make in EdReady will not be saved. After clicking the Sign Up for EdReady button, you will see a screen like this. You’ll need to confirm your email address before you can continue, so go to your email program and look for an email from EdReady. To complete your registration, click the link in the email (or copy-and-paste it into a web browser). Clicking the link will automatically log you into the EdReady site. If the link doesn’t work for you, follow the instructions in the email under “If you are still unable to activate your account.” You can also send a message to support@edready.org and we can help you (be sure to include your EdReady site URL). See also: how to log in on subsequent visits.